Today I made some curried pumpkin fritters, a variation on the “what the hell do I do with all these zucchini” fritters (that moment will come in the summertime!). 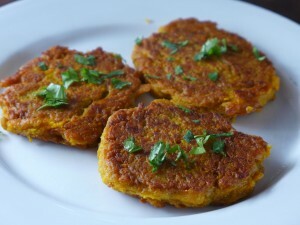 They are delicious too, but pumpkin and curry spices have a great affinity so these are a winner. They are fast and simple to make, and delicious. They are crispy on the outside and soft in the middle. Sometimes I serve them with a spoonful of coconut yoghurt, but I’d run out, so today I just scattered them with some fresh coriander leaves from the garden. This recipe would work with carrot and parsnip too. Grate the pumpkin coarsely into a bowl. Mix in the salt and curry powder. Stir in the chick pea flour. It will be a little dry, so add the water a tablespoon at a time until the mixture just sticks together. It shouldn't be wet. Heat the oil in a frying pan, turn the heat down to low. Add 2 tablespoons of mixture for each patty to the pan and neaten and shape into patties and loosen from the bottom so they don't stick. Allow to fry on that side for 2 minutes, and then carefully flip and cook on the other side for another 2-3 minutes. Drain on paper to remove any excess oil. I’m having a bit of a love affair with chickpea flour myself. I made omelettes on Monday, but haven’t had a chance to write the blog post yet. (Can’t seem to manage to do both!) They were so good, I have been wondering what else I might make with it. These fritters look like just the thing (although half of my family hates pumpkin. Grrrr…), so the carrot and parsnip might be a good option. Chickpea flour really is so fabulous!